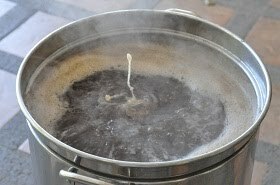 Thirsty Pilgrim: Late Sunday Brew Day Musings. A major beery disadvantage of living in the tropics: Hops and barley and Orval don't grow here. You've got to order them. Or pack them into your luggage. A major beery advantage of living in the tropics: The weather is nearly always suitable for brewing out of doors. And so we do, on many Sundays. Today it was a red ale extract kit at a friend's house. We threw in some extra aroma hops at flame out. You know, for good measure. Next weekend it'll be a more involved affair at our place: an all-grain 10-gallon batch of saison that we'll split in half. Each half will get different sorts of yeast. We are experimentating. A few months ago, we were swimming in a pool on the Nicoya Peninsula. Having cocktails and making merry. Another friend stepped on my eyeglasses and broke them. He felt pretty bad about it, and he offered to pay for them. I told him all he had to do was mail me some Orval. So he did. Two bottles. I still believe I came out ahead in this deal. I'm not sure, but there might not be another Orval within thousands of miles of here. Now there are none. I drank them both, after I threw the dregs of both bottles into some fresh wort. Hopefully those little buggers will multiply and find themselves prospering in five gallons of that saison. Sooner or later. It might not work. Either way, I just finished drinking more than a half-liter of Orval. I win. And to think I used to be able to buy this stuff at the corner market. Have I ever told you that the famous and beautiful Orval glass is worthless, except for as a showpiece? It does that beer no favors. Try a pint glass.